Mes amours, you may be armed with a très chic camo military jacket; in possession of combat-inspired booties ideal for strutting your sassy stuff up and down the sidewalks; and clad in skinny military pants that make your legs go on for miles. Now the only thing you need to truly forward march into the fall season is a charming carryall that stays in tune with 2010’s military-themed style; which is precisely what one (1) of you glamazons will be taking home courtesy of ClothesOutSale. Oui, oui, darlings! Café Fashionista has teamed up with ClothesOutSale to bring one (1) of you beautiful bunnies a Rothco Heavyweight Classic Messenger Bag – an absolute necessity for toting your everyday essentials from here to there in style! ♥For one (1) entry, leave a comment on this post stating which Rothco Heavyweight Classic Messenger Bag color is your favorite (Black, Olive Drab, Woodland Classic, or Stonewashed Olive Drab) between now and Friday, October 1, 2010 at midnight PST. ♥For two (2) entries, Twitter about this giveaway, and leave a comment on this post stating which Rothco Heavyweight Classic Messenger Bag color is your favorite (Black, Olive Drab, Woodland Classic, or Stonewashed Olive Drab) between now and Friday, October 1, 2010 at midnight PST with your Twitter URL. ♥ For three (3) entries, become a follower of Café Fashionista on Blogger/Google Reader/Google Friend Connect/Twitter, and leave a comment on this post stating which Rothco Heavyweight Classic Messenger Bag color is your favorite (Black, Olive Drab, Woodland Classic, or Stonewashed Olive Drab) between now and Friday, October 1, 2010 at midnight PST (if you are already a Café Fashionista follower, please say so in your comment). I will randomly pick one (1) name out of a hat (who knows, it could be yours! ), and announce the winner on Saturday, October 2, 2010. This Giveaway is open to U.S. Residents! Winner will be able to choose the bag color of their choice. Thanks to ClothesOutSale for the picture. Oh My!! wish I was US resident!! fabulous giveaway! Good Luck to the winner!!! :) Have a great weekend Erika! I love it! Cool bags. I love the olive drab color! The woodland classic is my favorite. So cute and would fit into my wardrobe perfectly. Thanks for the circle scarf idea, I have shown it off on my beehive post. I like the olive drab, i do follow your blog and will be tweeting! Oooh I'd love the black one! the woodland classic is great. I really like them all though!! cute bags. Oooh! I love the olive drab one. i'm a follower! i love the black one! Can I enter if I live abroad, but would have the bag sent to my mother in the US? Please, please? I like the stone-washed olive drab bag. The olive drab is fab!! You are wonderful for doing all these giveaways for your readers! I've always loved messenger bags! Love the black and Olive Drab one.! I'm torn between the Olive Drab and the Stonewashed Olive Drab! Painful!! The olive drab colour rocks! Love it.Good luck to the winner. Bag love! I like the good ol' woodland classic. I am a follower on google connect/blogger. so cool. love the black messenger bag. Beautiful bags. I'd like to win one. Fabulous giveaway. I like the simple black one! I really like the black color. These bags are so practical and fantastic looking as well! I'm a bit partial to the olive drab color. And of course I'm a follower, love! I love the Olive drab! The Black bag rocks my socks! I tweeted and I like the black bag best! I already follow you on gfc and twitter and who knows where else. Hehe! I like the black one! I follow on twitter. Love love the Olive Drab. Fantastic for all the military inspired pieces going around. I'm a follower of your blog ('austen fan') via Google Friend Connect and I also tweeted about your giveaway here @trustandfairydu. Olive drab looks like the perfect versatile piece. Great! I jave been searching for a vintage messenger! The stonewashed Olive is my fav! the stonewashed olive is my fav! i love messenger bags. i want the black one. i'm a follower too. im a follower! and i luv the black one. My favorite is the 'Stonewashed Olive Drab'. I love the use of color, and how it is made rustic-looking due to the 'stonewash' effect. It would be AMAZING to win. I am a follower as of right this minute! :) I will continue to follow no matter what. Here is my other entry. 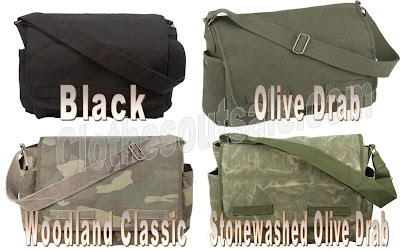 As stated I would love the 'Stonewashed Olive Drab' messenger bag.